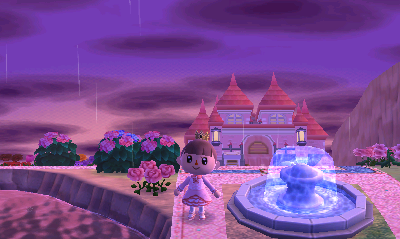 This is kind of random, but recently I realized that I can relate a lot to this post of Teru’s about having a hard time resisting taking pictures of the town tree at different times of day/year, only for me, it’s my town hall area that I’m always taking pictures of! I don’t know why, I mean it’s relatively simple landscaping — just a color fade of lilies and violets and some streetlights — but I just love the way it seems to completely change at different times of day. At night, the cool colors in the lilies/violets field stand out, and everything looks so icy and glimmering (bet that part will look even better when snow covers the ground). In the daytime and at sunset, the warm colors in the lilies/violets field stand out more, looking vibrant and fiery. So I think my flower field in front of the town hall suits my moon&sun concept really well, in an odd, abstract way! Early morning — everything cast in a dreamy, hazy blue, with some faint stars still in the lightening sky. Daytime — most boring to me since the streetlights aren’t lit up, and the daylight just casts a neutral light on everything. Late afternoon — the palette starts to get warmer. Sunset — just after 6 PM, when the streetlights first light up, and the time I usually have my dream town set to. I think both the cool colors and warm colors stand out nicely at this time of day! Dusk — the stars start to appear. Now that the sun has mostly set, the warm-colored flowers don’t stand out a lot anymore, but the cool-colored flowers start to look especially beautiful. Deep night — the blue and purple violets start to blend together (in a good way, I think), and the white violets and pink lilies look icy in the distance. I edited the rock out of this last one! 😛 The rock doesn’t bother me as much as it used to (I’m trying to get over it), but it’s still nice to have some rock-less pictures of my town hall, so I hope you don’t mind me editing it out every now and then! There are still some changes I want to make to my town hall area in the future, but I can’t do them yet. I want to maybe make some special (mosaic?) tiles with the moon and sun on them, and maybe even some water canal sorts of patterns. There are already many water patterns out there, but I thought I’d try to make mine have a fairy-tale style border or something! That’s very ambitious, though, since I’ve never tried making water patterns before — hopefully I’ll be up to the challenge. I can’t do these patterns until I get my dream neighbors, though, and make a permanent character for Fern. I don’t have enough pattern slots with just 3 characters. 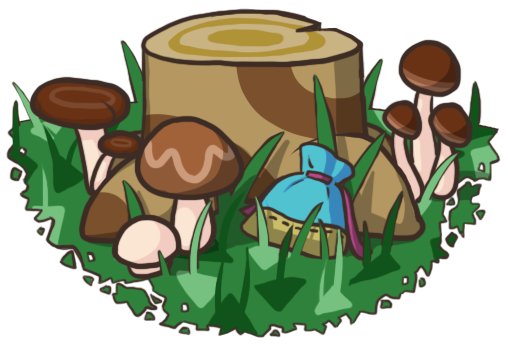 Posted on December 20, 2013 by Amy •	This entry was posted in AC:NL, Citalune and tagged Animal Crossing. Bookmark the permalink. Thanks! 🙂 I like the idea of my town hall being fitting for both my daytime and nighttime concepts (even though it’s technically on the “daytime” side of town), but I see what you mean about the inconsistency there, haha. Yep, I pretty much always set it to 6 PM! It’d be nice to mix it up a bit sometimes, but I always chicken out and just go with what I know will look good, 6 PM with the lovely sunset colors and the streetlights lit up. With updating it at night, I’m afraid that too many areas of my town won’t look their best (like the colorful areas), and with updating it in the daytime, I just have too many streetlights around town for that to be an ideal time to update at all. 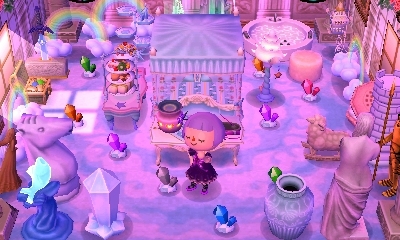 I hope to maybe update my dream town one day during an aurora and a special sunrise, though; I think those would be pretty! The 2 AM music is indeed lovely! ❤ I listened to an extended version on YouTube after reading your comment and it has such a nice atmosphere. I should try to find the snowy version on YouTube ^_^ I really liked the 2 AM song in Wild World too. I don't take music into consideration when choosing when to update my dream town, but I admit there's a few that I'm not crazy about at all (3 PM being one of them, haha). Thanks, glad you like it! ^_^ My town is behind so it might be a little longer before I reach the winter solstice, but I look forward to it! If you go on there in the night, (8 or 9 ish) You MIGHT see an Aurora! I love the canal idea! 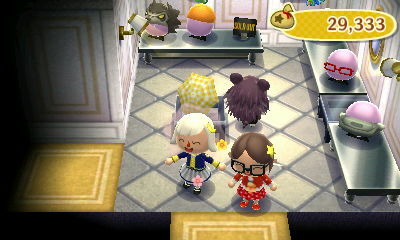 I recommend using Mayu’s Wild World pattern as a basis; it tiles really well! I used it for a bamboo area in my town and just altered some of the colours to better match a pond’s colour scheme. I’m pretty happy with how it turned out!